← Look for us at Summer Fest tomorrow! 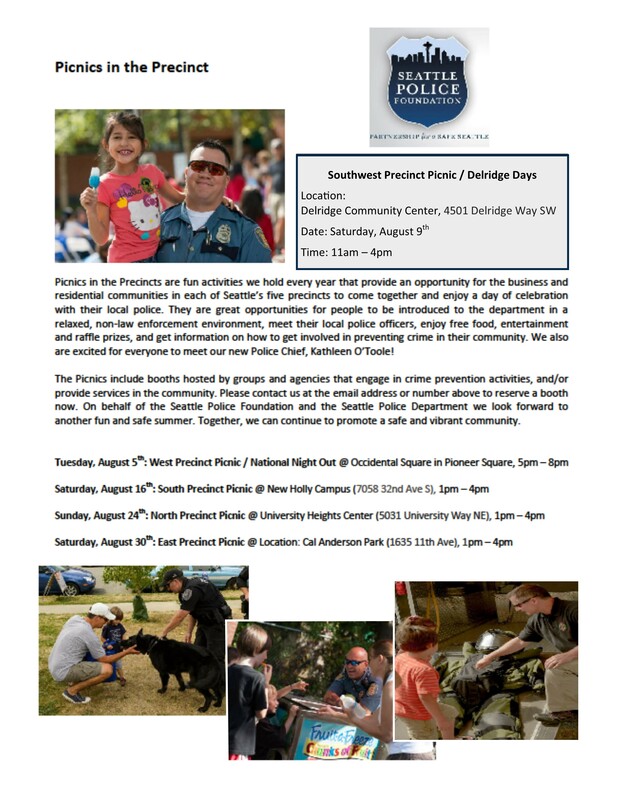 Mark your calendars for Delridge Day and the SW Precinct Picnic! We received word late last week that Delridge Day and the SW Precinct Picnic are being held jointly again this year! This great combined event will be Saturday, August 9th from 11 AM – 4 PM at the Delridge Community Center and in the adjacent park and Delridge Skatepark. Come enjoy wonderful music, food, and other activities! Look for us among the many exhibitors, vendors and community groups. This is our (West Seattle Be Prepared’s) last scheduled community outreach event for the summer, so stop by to learn more about our organization and/or pick up free printed materials. We still have free coloring books about emergency preparedness for kids of varying ages! We also have a wide assortment of disaster-related informational materials from the Seattle Office of Emergency Management, many of them available in multiple languages. It’s summer and time for ‘Picnics in the Precincts’! This entry was posted in Announcements, Events and tagged Delridge Day 2014, SW Precinct Picnic, West Seattle Be Prepared, West Seattle emergency preparedness. Bookmark the permalink.